Story by Wendell Huffman. Photo courtesy Gary Avey. The article that follows, and the supporting research, was borne in the 1980’s out of the author’s interest in the Sacramento Valley Railroad. Wendell was later sought to provide input and act as a juror in the design competition for the restoration of the Folsom Turntable and railroad block. Wendell is a member of the FEDSHRA and a librarian at the Carson City Library. The photos show the reconstruction of the 1867 Gallows style turntable on the original granite base at it’s original location. The first of several turntables to be used at Folsom, California, between 1856 and 1913 was one of two delivered to the Sacramento Valley Railroad via Cape Horn on the clipper Dashing Wave in June 1855. Because construction of the railroad itself took precedence, the task of assembling the knocked-down turntables did not begin until December of that year. Both were assembled at the company’s shops at the Foot of R Street in Sacramento, and the Folsom turntable was conveyed to the line’s eastern terminus soon after the rails reached that point. The turntable was installed at Folsom on 16 February and was first used to turn a locomotive four days later. While the Sacramento turntable was actually ready for service three weeks earlier, it appears from contemporary sources that no SVRR locomotive was turned until the Folsom turntable was first used. The first SVRR turntables were of the deck type with the railroad track laid on the top “deck” of the turntable bridge (hence the name of this style). The turntable itself consisted of a forth-foot wooden truss bridge pivoted on an eight-inch disc-type center bearing. The weight of this swing bridge was supported on six conical wheels—two at each end, while two more wheels were apparently located at the ends of a lateral beam which stabilized and centered the rotating structure. These wheels rolled on a flat cast iron circle rail laid around the perimeter of the turntable pit. Much of this description of the first SVRR turntables is based on an account in Holley’s Railroad Advocate of 7 February 1857. This report indicates that these turntables were turned by means of the “common gear at the side”; however, what is meant by this is unclear. While some early turntables were indeed operated by a geared hand-crank, most early turntables were pushed around by brute strength. What is certain is that turntables which were supported on end wheels—such as the SVRR’s first turntables—were difficult to operate. A contemporary note in the Folsom Telegraph indicates four or five men were required to turn the first Folsom turntable. A preliminary excavation of the Folsom turntable site conducted by PAR Environmental Services, Inc., in April 1995 revealed that the original turntable pit had an inside clear diameter of forty-feet ten-inches and was approximately six feet deep. The brick pit retaining wall was seventeen inches thick. Several pieces of the granite foundation for the turntable’s iron circle rail were found still in place. Folsom’s first turntable was provided with a grade-level wooden deck which rotated with the turntable and covered the entire pit. Such turntable covers were once fairly common and, like the covering on wooden bridges, protected turntables from the elements. However, as the Central Pacific’s first Sacramento turntable (installed in early 1864) is known to have been provided with a covering specifically to prevent people, animals, and vehicles from falling into its pit, it seems likely that Folsom’s turntable with its six-foot deep pit was also covered as a safety precaution due to its location immediately adjacent to the busy station plaza. A surprising feature disclosed by the 1995 excavation of the turntable site is a brick-lined trench extending about eight feet away from the 1856 pit. The function of this trench was apparently to provide workers access under the cover to the turntable mechanism. This trench was apparently covered adjacent to the turntable and extended as far as it did to provide an uninterrupted walkway around the turntable’s edge. 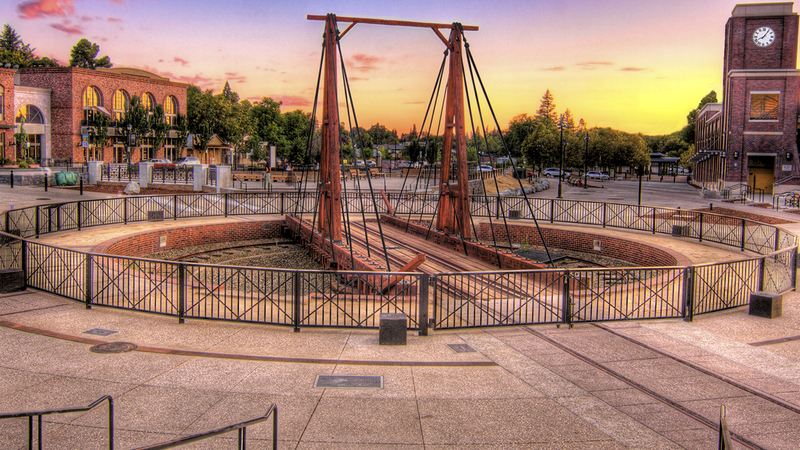 Folsom’s original turntable was replaced late in 1867. In contrast to the first turntable—which required several men to operate—the new turntable could be turned by a single man, according to the Telegraph of 14 December, 1867. This report is significant as it suggests that the new turntable was of the center-bearing style then coming into vogue. As the center-bearing design concentrated all resistance to rotation at or near the pivot—where the greatest leverage could be applied—center-bearing turntables were far easier to operate than end-bearing turntables. While late model center-bearing turntables were sometimes equipped with a perimeter circle rail, this served only to support the ends of the turntable bridge while locomotives entered or left the table and to prevent the turntable from being upset should it come out of balance during operation. Center-bearing turntables could be of either the deck or through design (in which the track runs “through” the bridge structure). However, in either case, center-bearing turntables had to be longer than end-bearing to handle identical locomotives since the center-bearing design required enough room to allow a locomotive and tender’s combined center-of-gravity to be positioned directly over the turntable’s center (which an end-bearing turntable had only to be slightly longer than a locomotive and tender’s wheelbase). Thus, if the second Folsom turntable was indeed of the center-bearing design, then it was most likely longer than its predecessor. Since only the top few feet of the original turntable pit retaining wall were ever demolished, a longer replacement turntable at Folsom must have been of the through pattern, with most of the longer turntable’s structure located above grade and extending out over the remains of the old pit wall. Indeed, the second Folsom turntable was most likely a wooden “A-frame” or “gallows” turntable. Such turntables were essentially center bearing, with all their load supported on a small circle rail laid on a center foundation. The gallows design required only a shallow pit, and the installation of a gallows turntable longer than the original Folsom turntable would have required only the removal of the top few courses of the old pit’s retaining wall. An additional reason to believe that the 1867 Folsom turntable was of the gallows design is the fact that the SVRR was closely associated with the Central Pacific by that date (being owned by the CP’s principal directors), and the CP was then using gallows turntables exclusively. If the SVRR followed the CP’s practice, then the new turntable was probably identical to the fifty-one foot gallows turntable installed at Rocklin, California just six month earlier. Just one year after the second Folsom turntable was built in 1867, yet another turntable was installed at Folsom near the SVRR carpenter shop. A subsequent newspaper report that a roundhouse was to be built near the “main” turntable confirms that this new turntable was indeed a distinct facility, and that at least for a time—Folsom had two turntables at once. It is hoped that future excavations will disclose the exact location and size of this second turntable installation. In July 1882, Folsom’s 1867 turntable was replaced after fifteen years of service. While a newspaper reference to this new turntable’s “derrick” assures us that it was of the gallows design, there is no definitive evidence relating to this turntable’s size. While the CP’s Sacramento turntable at the time was fifty-six feet long, fifty-one foot turntables were still quite common on the CP. Indeed, if their scale and accuracy can be relied on, Sanborn fire insurance maps indicate turntables closer to fifty-one feet than fifty-six feet for both Folsom and Placerville as late as 1890. Fifty-one foot turntables would have sufficed as only light locomotives built in the late 1860’s were then being used on the railroad to Folsom. The fact that the 1882 Folsom turntable lasted only nine years further suggest that this turntable was only fifty-one feet long. It may have lasted such a relatively short time precisely because its limited capacity became a handicap with the introduction of larger locomotives on the CP-SP during the late 1880’s. In October 1891 yet another turntable was built at Folsom, perceived by the Telegraph as a decided improvement over its predecessor. A photograph from this period showing the new turntable almost hidden in the shadows of encroaching eucalyptus trees reveals enough detail to identify it as a SP standard “Number 3” turntable. It appears on a 1901 Folsom station plat with a diameter of fifty-six feet—a dimension which conforms exactly with one of the pit retaining walls unearthed in the 1995 excavation. According to the local paper, the Folsom turntable was “reconstructed” in November 1908. Whether this is counted as a new or rebuilt turntable, it was apparently still a fifty-six footer as station plats through early 1910 show no change in the size of the Folsom turntable. However, just eighteen months after the 1908 rebuilding, Folsom’s fifty-six foot turntable was found to be too short. Concurrent with the introduction of the SP’s new seventy foot McKeen motor cars to the Folsom-Placerville branch, the Folsom turntable was lengthened in May 1910 to accommodate the new equipment. The only physical evidence yet found relating to the 1910 enlargement is the apparent fact that the upper courses of the fifty-six foot pit wall were uniformly removed to the same level as the old forty-foot pit wall. This indicates that the fifty-six foot was deliberately lowered to allow a longer turntable to clear. It also indicates that the 1910 turntable required it no deeper than the previous gallows turntables and was, therefore, apparently still of the gallows design. While wooden gallows turntables longer than fifty-six feet are otherwise unknown in the extant SP records, the Folsom turntable appeared on a 1913 station plat as sixty-six feet in diameter. Folsom’s last turntable remained in service a mere three years and was replaced in March 1913 with a wye track constructed just west of Folsom at the Placerville switch. Immediately upon completion of the wye, the Folsom turntable was dismantled.